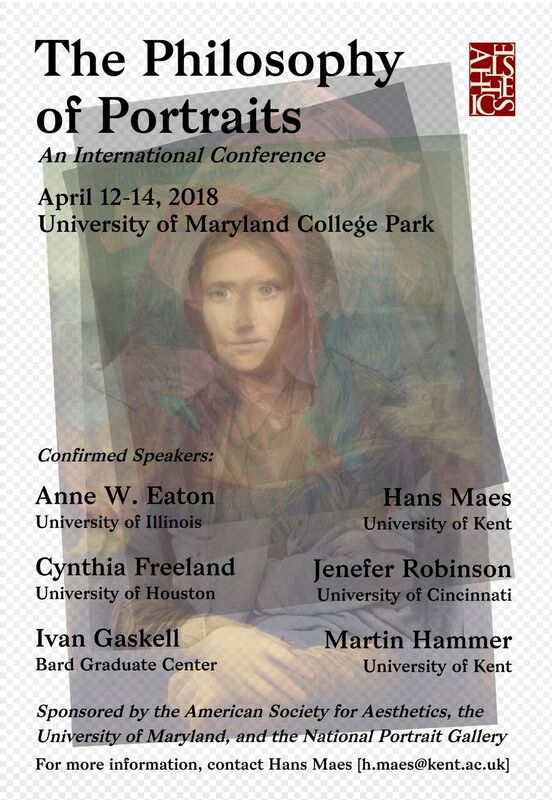 The American Society for Aesthetics Board of Trustees has approved a grant of $3,990 for a conference on "The Philosophy of Portraits" at the University of Maryland, April 12-14, 2018. The conference has been organized by Hans Maes, Senior Lecturer in History and Philosophy of Art and Director of the Aesthetics Research Centre at the University of Kent, and Jerrold Levinson, Distinguished Professor of Philosophy at the University of Maryland. Confirmed keynote speakers include A.W. Eaton (University of Illinois), Cynthia Freeland (University of Houston), Jenefer Robinson (University of Cincinnati), and Dorothy Moss (National Portrait Gallery). Please register to assist the conference organizers in planning. Registration for non-members of ASA is $35. Congratulations to Matteo Ravasio (Auckland) and Eleen Deprez (Kent), recipients of the ASA Student Travel Grants to present their work at this meeting.